Much of green-reading is based on the experience you have had, remembering what greens looked like they would do and what they actually did. When you read a putt, you reach into the bank of putts you remembered and pick out the one that looks the most like this one, weigh the two, and come up with a solution. That’s really what green-reading is. This post is about how to organize your reading so you can store your memories in a way that makes them easily and accurately retrieved. When you walk up to a green, maybe from 100 yards out, notice if the table of land that it rests on is sloped in any way. You might not be able to see it from the angle you have, but it’s there. That slope will tend to pull putts in that direction. When you get on the green, find the high point and the low point. Forget about where your ball is for the moment. Just look at the green in general. Most of the time this slope will conform to the slope of the land you looked at coming up the fairway. These first two looks show you slope that must be taken into account. Your putt might break a different way, but if you’re going to ignore the overall slope of the putting surface, you have to know what it is first and have a good reason for ignoring it. Now look at your putt from the low side, to see changes in elevation that would cause you to hit the ball harder or softer to get the ball over the distance to the hole. The farther from the hole the ball is, the more important speed is, and the more important it is that you take this look. Try to do it when someone else is lining up their putt so you save time when it’s your turn. Look at the putt from behind the ball unless you are putting up or down a slope. In that case, look at the putt from the downhill side looking uphill. Contours are easier to see. Look first for the general shape of the putt—if you were to hit the ball straight at the hole, would it go in, or end up to the right or to the left? If the ground gives you two breaks, say right to left at the start, the left to right at the end, account for both, but give the latest break more allowance, since the ball will be traveling slower and be more affected by the slope of the ground. It is not entirely necessary to look at green contours from close to the ground. You can see all you need to from a standing position, maybe bending over a bit to look from a height of four to five feet. Reading longer putts from behind the ball does not let you see contours around the hole clearly, and that is where you need to pay the most attention. Walk up to about ten feet from the hole and straddle the line of your putt so you can get a good look at slopes near the hole. Don’t guess from way back there. You should have a good feel for how hard you want to hit the putt. 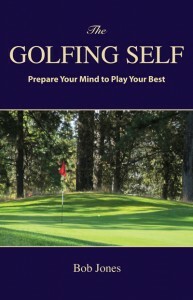 Put that information together with what you see on the ground to pick a starting line for the putt. Do that with this next bit in mind, probably the most important thing I will say today. Beyond a certain distance, you’re not realistically trying to sink the putt. You know that if you did it would be good fortune rather than your skill that got the ball in the hole. Your skill, however, is what gets the ball close and gives it a chance to go in. 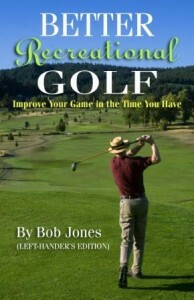 Your goal then is to see how to send the ball across the green to place where good fortune can take over. That’s how you leave yourself tap-ins, and that’s how those twenty- and thirty-footers go in every now and then. Organize your green reading this way, going from the general to the specific, step by step. That pulls out one recognition at a time and lets you build our read logically without guesswork. Remember that you will never read greens perfectly. Did you ever see a pro on TV let a putt slide by the hole a hair on the right and have an expression of complete disbelief? 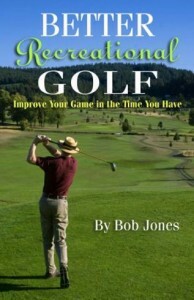 Have you ever heard the announcers on TV say, “This putt goes left, doesn’t it Roger?” “It does Johnny, but it looks like it goes right, and no one so far today has figured out that it doesn’t go that way.” All you can do is read the green based on what you know, and if you get it wrong, file away the correction for next time. In friendly games, if the ball sails OB or looks like it could be lost, most players will drop another one right there and play on as if nothing had happened. Or, they go to where they think the ball went, can’t find it, then drop another and play on as if nothing had happened. Let’s get this right. If you think you hit the ball out of bounds or that it might be lost, this is what you do. Inform your playing companions that you will play a provisional ball, using just those words. Saying, “I’m going to tee up another one,” or “Let’s try that again,” or the like doesn’t count. You must also play the provisional ball before you go looking for the original ball. So now you’ve hit the provisional ball and all is well with it. What you would do next is look for the original ball. If you find it and it is not out of bounds, then it is the ball in play and you must pick up the provisional ball. If the original ball is found out of bounds, or you cannot find the ball after having searched for five minutes, the provisional ball is in play. You do not have to look for your ball, but if it is found by anyone before you make a stoke with the provisional ball, the original ball is in play. You may play the provisional ball without obligation until it reaches or passes the point where the original ball is likely to be. If you make a stroke with the provisional ball with it lying at or nearer to the hole than that point, the provisional ball is in play and the original ball is lost. The penalty for a ball lost or out of bounds is stroke and distance. Say you hit your tee shot out of bounds. That’s one stroke, the penalty stroke is two, and hitting the provisional is three. When you get to the provisional ball, you will be hitting your fourth shot with it. Out of bounds is generally marked by white stakes. Tip: when you play a provisional ball, make sure it is one you can distinguish from the original ball. If the provisional ball ends up near the original ball and you cannot tell them apart, then both balls are lost and you have to go back to the original spot and hit again, under a second stroke-and-distance penalty. Deep Rules: A player may, at any time, play another ball from where the original ball was last played under a penalty of one stroke. That ball is not provisional, but is the ball now in play. If the ball is lost in an immovable obstruction, in an abnormal ground condition, or has been moved by an outside agency, the player must proceed under the rules governing those cases. If you think your ball might be out of bounds or lost, but might also have came to rest in a water hazard, you may play a provisional ball. If you find the ball in the water hazard, you must abandon the provisional ball. The friendly game scenario where a player drops a ball where the ball was lost or OB and plays from there? The player must go back and play properly under stroke and distance and take an additional two-stroke penalty for breaking the rule.